Ditch the tedious calorie counting to get (and stay) healthy once and for all. 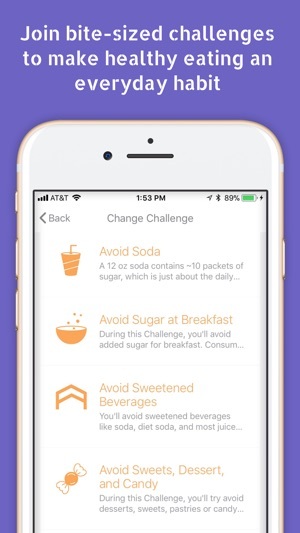 Foodstand is an app that helps you eat healthier through our community-powered Good Eating Challenges. Challenges are based on basic good eating principles that apply to everyone. Recently named one of the Top 8 Ways to Eat Healthier in 2018 - by the Today Show. If you, like many of us, will only stop eating junk food or fast food when someone pries it from your hands despite knowing veggies are better, you know old habits die hard. That’s why Foodstand Challenges are designed based on the latest in habit building research and behavioral therapy to ensure you’ll be successful, and will enjoy the process along the way. - Simple 2-second draw-a-check-mark tracking with fun, positive responses. No need to log every morsel of food or track calories. 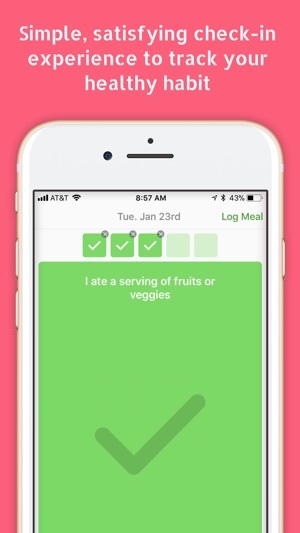 You can add optional info to keep a food diary if you’d like, but it’s not required. - Daily motivational reminders and tips based on your progress, so you’ll have support to stay on track. - Each challenge has easy levels and free passes because we believe in progress over perfection. 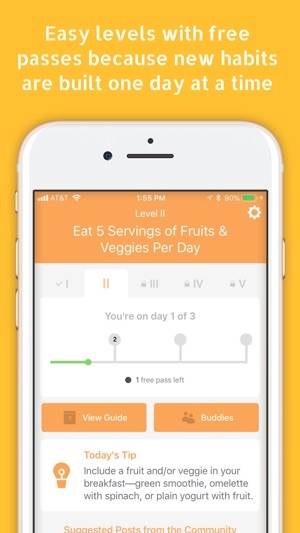 For example, Level II is a 3 day challenge and comes with a free pass, so you don’t need to go ‘cold turkey,’ and you’re more likely to stick with it. - Community support — you’ll be able share ideas, ask questions, and learn from thousands of others doing the same challenge as you. 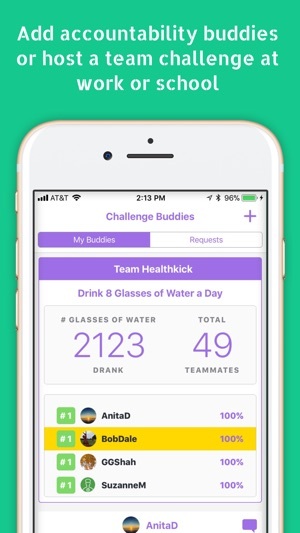 Soon, you’ll also be able to add a buddy to a challenge. - Each challenge comes with a Guidebook that includes tips, recipes, a shopping list, and more details on why this habit is a good idea. You won’t find any fad diets or crash cleanses on Foodstand because we know those don’t work. You’ll only find challenges to help you build good eating habits that will lead to long-term health. Our good eating challenges have been designed in collaboration with several Registered Dietitians, Center for Science in the Public Interest (CSPI), Johns Hopkins Center for a Livable Future, THI, and several others. "Ive been able to create a better healthy eating plan for myself. I've also been better at planning out meals which created better meal budgeting and portion control. I've lost 20 lbs solely due to the challenges from Foodstand"
"Foodstand is a powerful tool for anyone seeking to make some changes to their relationship with food and eating. Capitalizing on the science of learning and behavior change, and setting this within a supportive and engaging community setting, Foodstand maximizes the chances of making healthy changes to eating behavior. Foodstand makes it easier to do the right thing when it comes to eating." - Brian Iacoviello, PhD, Assistant Professor at the Icahn School of Medicine at Mount Sinai. I work in the food world and oftentimes feel as if I cannot keep up with what is happening in the industry, despite me BEING in the industry. Foodstand bridges that gap so easily. With their new version, I can now find events in my neighborhood, help others with questions, and even ask my own. The best thing is that it’s connected to the “Good Food Movement,” which in a way, is a self-selecting group of people who care about food systems…healthy food systems. It really is the good food community that lives in my pocket. Thank you for creating such a worthwhile tool. 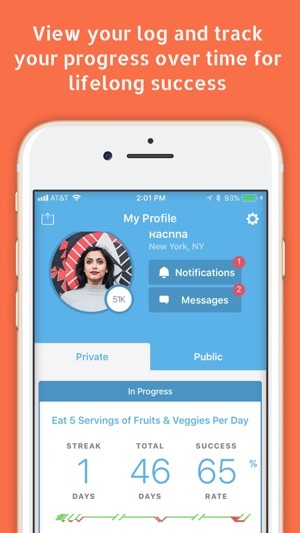 Seriously, folks; this app is going to be huge. Those social media friends that always post pictures of what they're eating on Instagram, Facebook, etc? I'm that guy. But Foodstand gives me a reason--and a beautiful, user-friendly platform--to showcase my eats with pride, and it also lets me connect with friends in an entirely new way. All of my foodie friends are psyched to jump in here, and I really think Foodstand's where it's at. Can't recommend it highly enough! I joined Foodstand last fall and immediately felt at home. It's a great community of like-minded people looking to learn more and advance the good food movement, and it’s only gotten better with the reboot including links, tips, questions, discussions, etc. I love that I can find a variety of content from people of all different backgrounds (writers, chefs, farmers, etc.) but the core theme of good food runs strong throughout it all. The feed and design is beautiful to look at as well!